Once a 9-hole golf course, the Quartzite Campground was converted to campsites in 1962, creating the closest campground to the North Shore Visitor's area. The landscape here is what you'd expect from an old golf course: slightly rolling terrain, mostly open to the sky, with a good collection of stand-alone shade trees scattered about. This is certainly the sunniest campground at Devils Lake, great for spring/fall camping in colder weather. The Quartzite Loop is the most convenient Devils Lake camping area, within easy walking distance of the Nature Center, Chateau, and North Shore hiking trails. It's also easier to get in and out of the Quartzite Loop, as the campground connects directly to County Road DL, north of the Park. 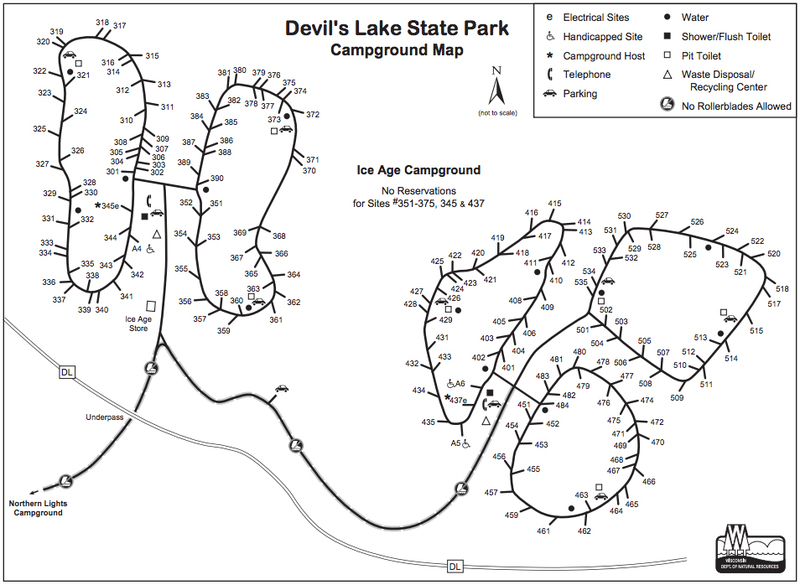 While Quartzite is the most accessible Devils Lake campground, it is also the least private. On busy summer weekends, expect to feel a little cramped amongst the rows of RVs in Quartzite. To avoid feeling crowded out, reserve a site on the perimeter. 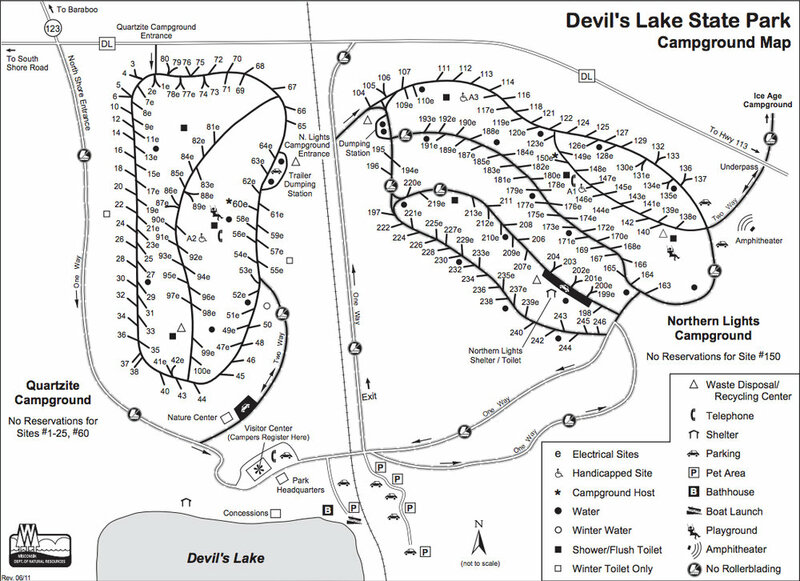 Laid out in the 1930s, Northern Lights Campground is the oldest campground at Devils Lake. Nestled into the terminal moraine northwest of the North Shore, Northern Lights consists of two main loops hugging either side of a large, sloping hill. Northern Lights has both sunny (eastern half) and forested (western half) sites; choose your site according to the season and/or your tastes. The original stone bath/shower house at the north end of the campground is probably the most attractive and well-built campground bathroom in Wisconsin, thanks to the Civilian Conservation Corps. The Ice Age Loop is the largest and most remote Devils Lake camping area and is split into western and eastern sections. The Ice Age West features private, generously-spaced sites surrounded by dense, young forest. Most sites here receive midday sun. Ice Age East, on the other hand, sits inside an older, more developed forest. Most sites in the Ice Age East campground are fully shaded, covered by a thick canopy; these are probably the most intimate and "out there" campsites in the Park. Our favorite Ice Age sites are in the eastern section, on the southeastern margins (sites 462-472 and 510-520, roughly). Since the Ice Age area is further from the North Shore concessions, it has its own store south of the western loops (see map). Ice Age does not have a playground for kids (as Quartzite and Northern Lights do). 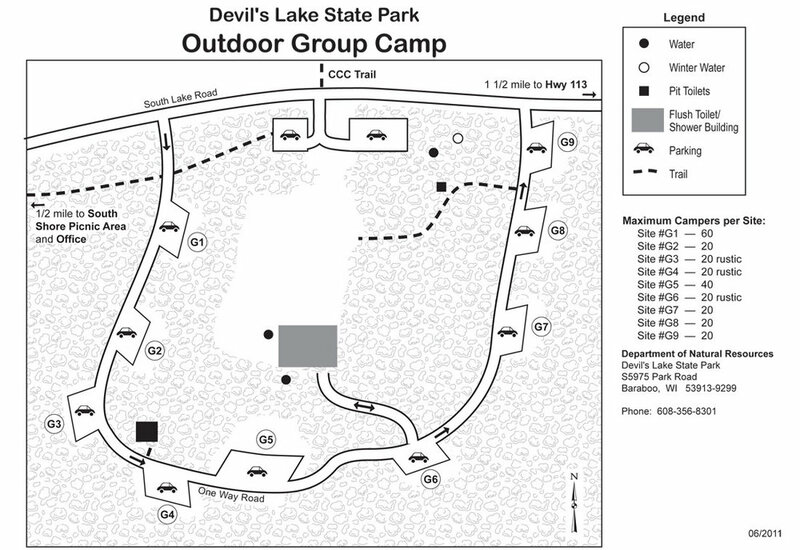 If you are camping with a large group (8 or more people) at Devils Lake, you may prefer a Group Camp Site over multiple individual sites. This area is particularly fantastic for climbing groups, as it's only a few hundred yards from the Group Sites to the CCC trail to the East Rampart. Each group site holds a different maximum group size: Sites 2, 3, 4, 6, 7, and 8 accommodate 20 people each; Site 5 accommodates 40 people; and Site 1 hosts up to 60 campers. All vehicles entering Wisconsin state parks must pay an admission fee. You can choose a daily, annual, or 1-hour pass. In-state license plates pay $8, $28, and $5, respectively, while out-of-state plates pay $11, $38, and $5 for the same passes. Seniors and buses get a price break. You can purchase your pass when you get to the Park OR order yours by phone at (888) 936-7463.